You could say it’s a once in a lifetime moment when terpelatuk.com finally got the chance to meet Vincent Majid –a well known fighter, not only in the MMA world but also in other martial arts he does such as Sambo and Luta Livre. While it might as well be true, in real life, it surprised me how easy our conversation turned into a somewhat warm, relaxed, and funny one. The fact that I also got to meet Prof Alan Dos Santos –the Brazilian MMA fighter who has made his own name known in the professional since 2009 with a smooth 16-3 record, was just the cherry on top of the ice cream. He was invited to Luta Livre seminar held in Nerium. Frankly speaking, I don’t really know much about him aside from reading his records from Sherdog, but just by getting a glimpse of him during our introduction, I immediately knew that I’d respect him and well, there’s just this undeniable champion aura he oozes. Vincent called him the Professor –a nickname to suit such a person with high competence in the self defense art he mastered in Brazil -a black belt at that too. I got to meet the duo at the hotel and we decided to talk somewhere else more representative of the city. Of course, I was accompanied by my friend Budi from Han Academy and also Vincent’s wife, Widya. I only knew Budi a few weeks ago from an MMA enthusiast group in Facebook and we clicked quite quickly from then. It was Budi who texted me and arranged this meeting. So I went to said hotel and met Vincent in person for the first time. I don’t think I should mention his positive attitude -humble and lovely to talk to despite his status, anymore because all of you might already know that. Or his MMA and Kickboxing records both at 6-0 and not to forget his self defense background, I probably know less than what you guys do. Moments later Prof Alan found us at the lobby, and how pleasantly surprising it was to find that he was –so humble and friendly. I could almost see a Javanese person in him! While we enjoyed the trip to our designated location that hot afternoon –lots of traffic, by the way, we decided to go straight to questions and answers. I honestly had 10-15 questions for them all set in my head, but I decided against it and tried to have a more relaxed conversation as if we were old friends. I’m not entitled to playing reporter anyway, haha. 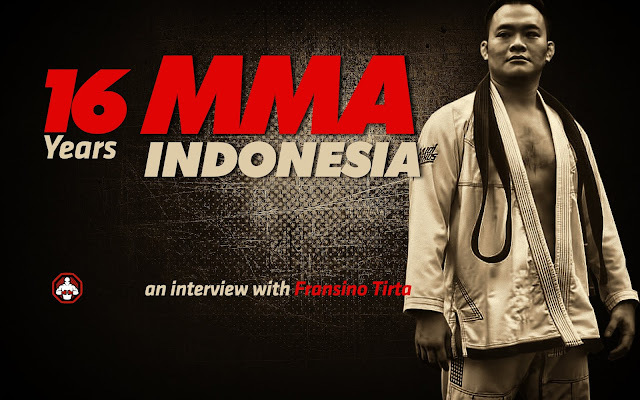 The latest update from Coach Vincent Majid, who was wearing his brown Luta Livre belt which he had just gotten from Mestre Marcelo Brigadeiro through Prof Alan Dos Santos earlier this November, Vincent also had just won a fight in an event called Fight against Drug in Batam, October 28th exactly on the Indonesian youth pledge –in which he defeated Shafiq Marican, a Malaysian heavyweight pride by an Americana lock. Congratulations once again Vincent, stay humble and never stop training! How did you get in to this MMA sport? This was the question I managed to ask Prof Alan as soon as we sat on a table, waiting for our food to be served. I might have an impression that a Brazilian fighter would start somewhere from street fights, but it appeared that I was wrong. Alan learned a bunch of self defense practices and started boxing around the age of 20 –so, definitely not from the streets. He began his MMA debut in 2009 and managed to get a 16-3 record, the wins from 8 submissions, 6 KOs and 2 decisions accordingly. His last fight was in 2015. When being asked whether he had any thoughts of going back into the Octagon, he said he wouldn’t reject the offer as long as the doctor approves. FYI –he is also a cancer survivor. Such a strong man, he is. When asked Do you like to stand with your opponents or take them to the ground? He said that he likes striking but off course he loves ground game because he enjoy the situation. I think the best question asked was, "So when are we going to do the interview Pak?" Wait... what have we been doing? Lol. And, Yesterday, I was lucky enough to attend Prof's seminar at the Nerium. And here are some documentation I took. Thank you Sifu Vincent Majid and obrigado Prof Alan Dos Santos. Maturnuwun mas Budi dan mba Widya. Sukses selalu. blog sedang error, beberapa gambar yang diupload tidak muncul di postingan. Sedang dalam perbaikan. The general position of each person formed from the set circumstances, among which the most important. Kinds well-being presented complex system, on which not only common mood depend, but also ability to work of the organism. No chance unravel and explore state of health, types health, and additionally other components of the healthy strong organism, if thoroughly not go into the next position. So, the health of a person, to date, is called standard and durable psychosomatic state of the individual.